Your sunset just got upgraded. Sail aboard one of our classic yachts for a Newport Sunset Sail. Step aboard for some of the best sailing in the “Sailing Capital of the World”! Give the gift of sailing this year to your loved one! A memory will last a life time. Dedicated to providing the most perfect hospitality and sailing experience one could find in Newport RI, Sailing Excursions hopes for the privilege of escorting you on a breathtaking excursion aboard the most elegant yachts in the local Newport fleet: Schooner Adirondack II and Sloop Eleanor. While visiting Newport, Rhode Island you will find a number of land and water based activities. However, a classic schooner sail, whether it be a day sail, or sunset sail, is well known to be the quintessential Newport activity that will highlight your stay and be the lasting memory forever. Home ported in Newport, RI, the "Sailing Capital of the World", a sailing cruise aboard Adirondack II is the experience of a lifetime. On a typical sail cruise or charter, guests will see Newport's stately bayside mansions, a 19th Century military fort and beautiful old lighthouses. The sweeping vistas of Newport and Jamestown will provide the perfect backdrop for your sailing cruise or charter. The Newport RI sightseeing is all about getting on the water by boat and taking it all in while soaking in the sun. Whether buying tickets for one of our Newport RI Champagne Sunset Sails, afternoon Newport day sail, Dark and Stormy Sail, Sails and Ales Cruise; or Privately Chartering on of the sailboats for a special family event or corporate event, you will be amazed by their beauty and comfort. Sailing Excursions is a cousin to the well known Classic Harbor Line which is known for operating with amazing sailboats and classic yachts in Boston, New York, and Key West, but they are also renowned for their outstanding hospitality and customer service. 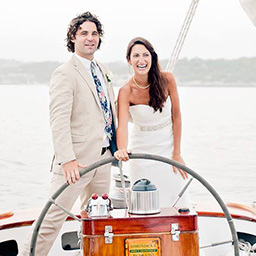 You will find your captain and crew extremely capable, accommodating, helpful, and friendly whether you are spontaneously buying tickets for a classic day sail or planning your one-of-a-kind wedding day. Built in 1999 by Scarano Boat Building, Adirondack II is reminiscent of a classic turn-of-the-century Pilot Schooner. Like the Pilot Schooners that worked the coast throughout the 19th century she is a wooden hulled traditionally rigged schooner and is a working boat known for her elegant profile and surprising speed. At 80 feet, she provides a comfortable, safe, high-performance sailing experience. With her roomy deck space and large cockpit, Adirondack II can accommodate up to 57 passengers. Her size, comfort and classic lines make Adirondack II the perfect boat for corporate and private sailing charters, leisurely day sails and sunset cruises on Newport Harbor and Narragansett Bay. Built in 2016 by Scarano Boat Building, Sloop Eleanor is a custom designed Scarano 48’ sloop that can accommodate up to 24 guests in her roomy cockpit with wrap around seating. Her size and classic lines make Eleanor the perfect for more intimate private boat party.